It can be distressing to have a child who is struggling and it’s even more bewildering when you feel like you’re on the streets of suburban Rome speaking one language and waving your hands frantically in the air, while your child frowns and speaks another. Imagine you have traveled to a foreign country. You wake-up and stroll out into the street of the picturesque little village that will be your home for the next two weeks. You are ready to take on the day as the new Simon Reeves; cultured adventure awaits! But first you need to just pop into the local supermarket, pharmacy or bank. Maybe you like to travel last minute, or without plans or maybe you’re just poorly organised or communication was last on your list of worries. Either way you haven’t planned ahead for internet access and there is no free Wi-Fi. The backup plan when Google isn’t an option is simple; ask a stranger for help. I mean, surely it can’t be that hard to find someone who speaks English. So you stop and ask a few locals; an elderly man, a young mum with her two children and a couple walking their dog. But they all shrug and smile awkwardly, repeating something in words that you do not understand. No one speaks English. While your stomach is starting to flutter with a rising concern you consider what to do next. What do you do? I have been in this situation in the outskirts of suburban Rome. I was looking for a supermarket and asked a lot of people. I tried miming, rather hilariously, a shopping bag and eating. My two travel companions tried their own versions and eventually a young woman pointed down the road, signalling some directions, her charade game on point. To end the story; we never found the supermarket. My sense of direction is atrocious and I had the feeling with all her frowning that the supermarket was more than a short stroll away. At least I learnt about my own assumptions and naivety. It is situations like this that make me realise how much my communication relies on words. You think I would know better than to be surprised. I’ve spent years working in various community sectors with people who have acquired brain injuries, mental health issues and physical disabilities that affect their capacity to express clear, cohesive and smooth speech. -The type of speech that we come to readily expect from each other as adults. Speech is our go-to form of communication but by no mean is it our only form of communication. In actual-fact speech isn’t always the most effective way to communicate. Speech might be the most direct and straightforward way to ask for directions, but expressing difficult and complex emotions and experiences via words can sometimes be very challenging, particularly for children. I explored why this is a little in my last post about development, the brain and healing. Firstly, remember that behavior is usually a form of communication. Sure, there are the terrible two’s (three’s, fours, fives…and teens), the whining, the bickering and the sulking that are part of childhood. But behaviors that are repetitive, destructive or distressing are usually a sign that a child is struggling with something and occasionally they indicate a bigger mental health concern. Repetitive behaviors like lying, stealing, bullying, running-away, self-isolating and disrupting should all be a red flag. Sometimes parents or schools will tell me that they think a child is simply “attention seeking”, at which point I both cringe but also agree that it is highly likely. BUT this isn’t a bad thing. My agreeing is usually followed by a re-branding of the term “attention seeker”. Attention seeking is nearly always viewed negatively and treated like the plague, with drastic resolutions to diminish it. But Attention seeking is just another form of communication and is quite often a communicated need packaged repulsively. Address the unmet need and the behavior usually reduces and disappears. That unmet need may be about security, anxiety, validation or boundaries. I also get reports that a child doesn’t respond to questioning, that they refuse to explain themselves or offer any explanation for their behaviors. This in turn tends to compound to others that they are simply naughty or needy. By remembering that the behavior is the substitute for words then it’s easier to understand that the expectation for a child to explain themselves can be fruitless. This doesn’t mean that we don’t address behaviors verbally and teach children about what’s appropriate. But it does mean that when behavior is functioning as a communicator or expression of a feeling then it is much more productive to work on bringing awareness to the feeling, encouraging expression, offering love and reassurance and helping them to develop healthier coping strategies over drastic punishment. I also encourage adults to get creative when communicating to children. Remember to slow down and meet them where they are at. Allow them lots of creative and play time to process what they can on their own. Facilitate time each day for them to feel they can approach you with questions or worries. 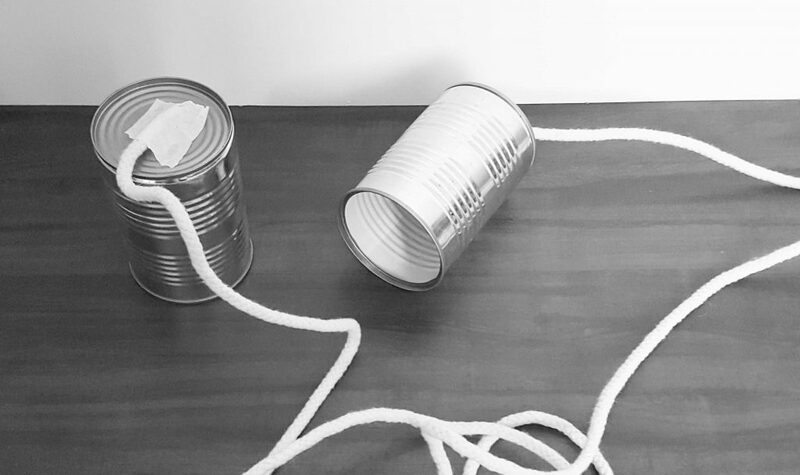 My favourite thing to do is create tin can communicators, walking talkies or a letterbox system. A degree of separation can sometimes help anyone, including children communicate well. (Why sometimes our most honest conversations happen in the dark before bed). Thirdly, no parent is perfect but try and avoid dismissing or ridiculing your child’s worries or concerns. This applies also to worrying that you think is inconvenient or petty. Children learn quickly what is safe to share and what isn’t but silence isn’t a cure. Usually poor communication between family members leads to bigger problems. Also spend some time sussing out what is healthy. It’s all too easy to over-focus on the natural trials and tribulations of childhood, or to over-compensate and think children are resilient to almost anything. I recently read somewhere the advice to get help if your child displays low mood-symptoms for longer than two weeks, the article was suggestive that after this time a diagnosis of depression might be considered. This is dangerous territory to get into. With children (or adults), there is no yardstick to measure emotional experiences, nor is there a quick fix. Hunting down a diagnosis will not cure your child or vanquish their pain. I often explain to parents that mental wellbeing is on a continuum (You may have noticed, I love my continuum’s). Fluctuation on that continuum is natural, it’s called life. You have to decide where along that continuum additional intervention and support is required. ngoing stressors in their lives, if psychological symptoms are accompanied by physical symptoms, how confident you feel in supporting your child and what exactly characterises your concern. It is always better to seek help if you are unsure or have a gut feeling. Writing down your concerns before approaching a professional can be really useful as vague behaviors and symptoms make it difficult to get a clear picture of what’s going on for your child. Find more information here. Lastly I often find an integrative approach is best. What works for some children may not work for others. Don’t be disheartened if you it takes a little while to find out what dialect your child is speaking and what country you’re in. Behavioral specialists, art therapy, music therapy, play therapy, counselling as well as occupational therapy, physiotherapy and speech pathology can all be useful for children depending on what they struggle with. Creating good communication between professionals can help limit overloading you and your child with strategies, information and conflicting opinions. While professional help can be useful and in some cases essential, don’t underestimate your own ability to support your child. Even if your family seeks professional help, you still have so much to do to help your child and it’s likely with some support you will be able to take over the reins. A loving, responsive and nurturing home goes a long way.